Tomb Raider 2013 got some major/minor graphic and savegame issues. So if you have problems with loading your games or experience some FPS drops, crashes, freezing (blackscreens) you may follow this guide .. I don't need anything from you I'm just a game nerd and like my fans so cheers! By the way I also found fixes for DmC Devil May Cry 5 2013 and Far Cry 3 2013. 5~ Block the game in this firewall.So steam can't ban you - they can ban your account, they can disconnect you from the game, they can encrypt your savegame files so you can't save next time. So BLOCK them. Where are the savegames located at? How to fix Tomb Raider 2013 black screen glitch? How can I fix FPS issue in Tomb Raider 2013? All these things have been fixed by Tomb Raider fans and can be found here. Is there any other game like this? What is your opinion on Far Cry 3 vs Tomb Raider 2013? On the Cutscene with the Russian just press ( F ) when highlighted , like on the first level , then when on the ground quickly tap several times ( E ) and finally press the first mouse button to shoot him . I didn't have to edit anything .. The fix hasn't succeeded for me at all so far... I've torrented the game twice from both Skidrow and nosTEAM, and I've used the built in crack, running as admin, and this, and nothing seems to work. I have no graphics issues, but every time I close the game my saves are deleted. 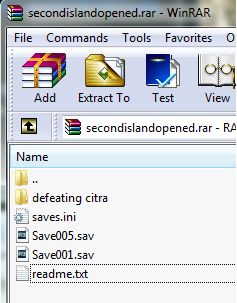 I've tried backing up the savegames and nothing seems to work. Any help is appreciated. Everything’s fine, just that when i start the game, save and quit, then i start the game again i have to play a new game, and my save game is lost. Any1? both of you block it in firewall!! Hi guys im having a problem with Chasm Shrine area, as I walk in as the samurai guy flies off the bridge, i walked into the shrine area to do the puzzle the textures are see through? I haven't had any other problems thus far with the game. I have tried all of the above, I still can't load my games after quitting the game. I completed around 40% of the game, and it started to lag, so I closed it by right clicking on the program in the taskbar, and after that my saves were lost. I've tried all of the above but nothing works. i get the messege"skidrow - appld is not configured" and i cant find out waht to do or how to fix it. help!! my chasm shrine door wont open? pls gimme a patch. chasm shrine door is closed. help! !